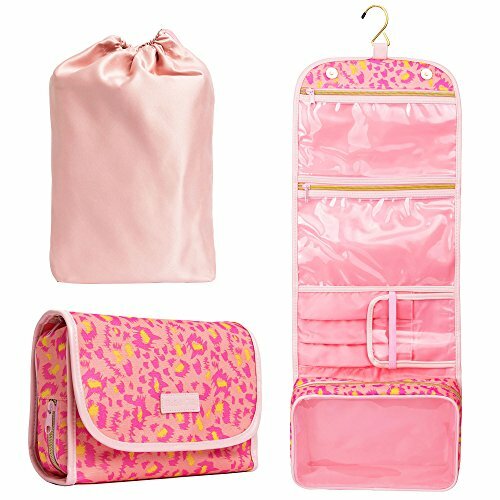 A animal print toiletry bag with a spacious interior to conceal everything from makeup to travel necessities , super light weight fabric makes it easy to transport when you're on the go . A stylish hanging toiletry bag for long wearing durability , features four pockets , which means that you will have all your essential beauty products organized and in place, saving you the chore of uprooting everything just to find your lipstick . 600 D Polyester Oxford fabric which means that is resistant to stretching and shrinking , feels soft and comfortable. Metal hook for hanging bag on a bathroom door , in a hotel or other locations , keeps your bathroom counter clutter free and your personal items easily accessible. Great quality stylish gold zipper . Stay on top of the game by avoiding any mishaps and unpleasant discoveries. We spare no measures in ensuring each item meets our stringent quality control standards. Add a dose of sparkle to your journey with this gorgeous leopard print Bella's Gift toiletry bag . If you have any questions about this product by Bella's Gift, contact us by completing and submitting the form below. If you are looking for a specif part number, please include it with your message.